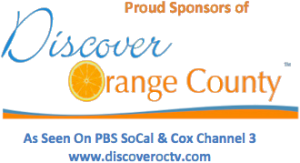 CLICK HERE and DISCOVER ORANGE COUNTY! 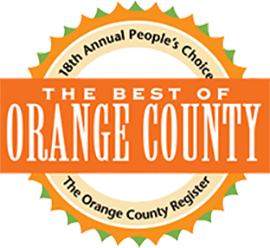 The Right Hair Salon is honored to be recognized as #1 Hair Salon — Best of Orange County by THE ORANGE COUNTY REGISTER, Top Hair Cut and Hair Color by the O.C. HOTLIST, the Cover Story feature in OC GAZETTE, prominent articles in INSPIRE and LADERA RANCH magazines, as well as featured promotions on KCal 9 CALIFORNIA ADVENTURE and YELP. Enormous thanks to our loyal patrons and wonderful staff for making this kind acknowledgement possible. 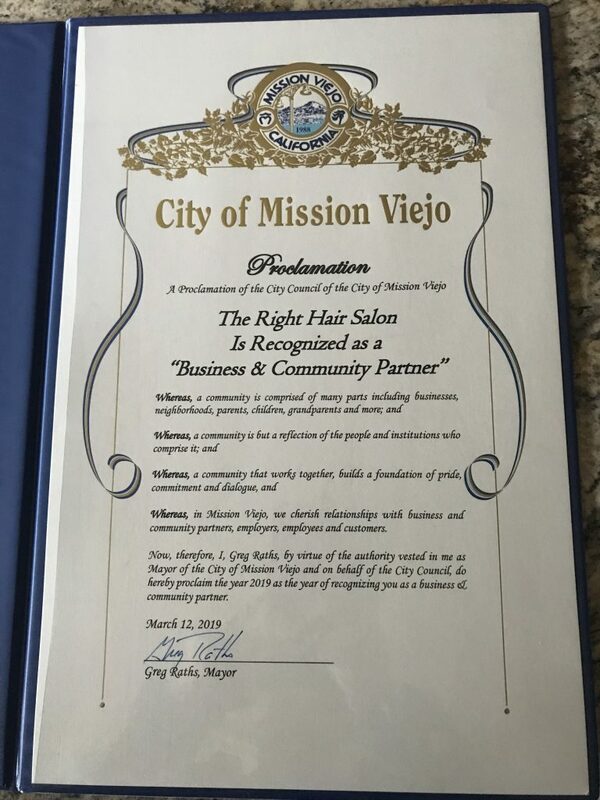 MISSION VIEJO, CA March 18, 2019 – On March 12th, the City of Mission Viejo and Mayor Greg Raths formally recognized The Right Hair Salon and owner Brandee Pacilio as a Business and Community partner. Mayor Greg Raths presented the proclamation to salon owner, Brandee Pacillio during the Mission Viejo City Council Meeting. 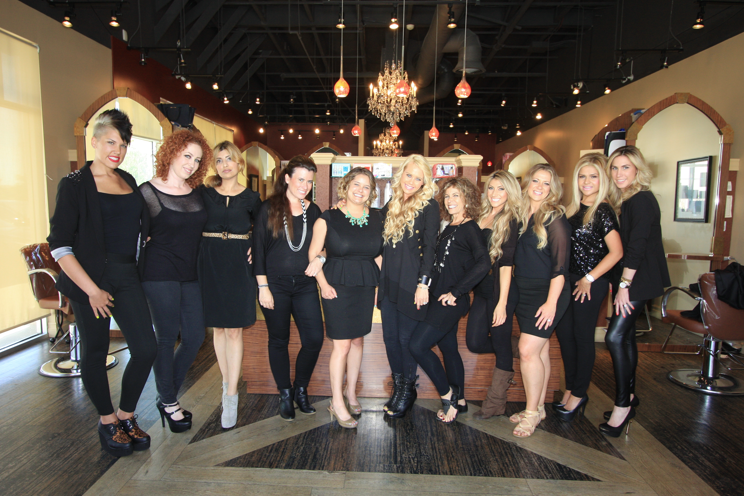 The Right Hair is a unique salon as Pacillio is a Master Trainer Stylist and has developed a proprietary educational program that requires stylists to train under her for a year, learning her techniques to hair styling; upon successful completion, stylists are offered a chair of their own at the Ladera Ranch salon. Pacillio and her team specialize in precision haircuts and styles, high-quality hair extensions, colors and highlights, and styling for special events such as weddings and proms. Starting her career in 1998, Pacillio has more than 20 years of experience in the haircare industry. Pacillio has a very special bond with her clients, many of whom have been seeing her for more than 10 years and won’t have their hair done anywhere else; even if it means hopping on a plane to see her every eight weeks after moving out of the Orange County area. 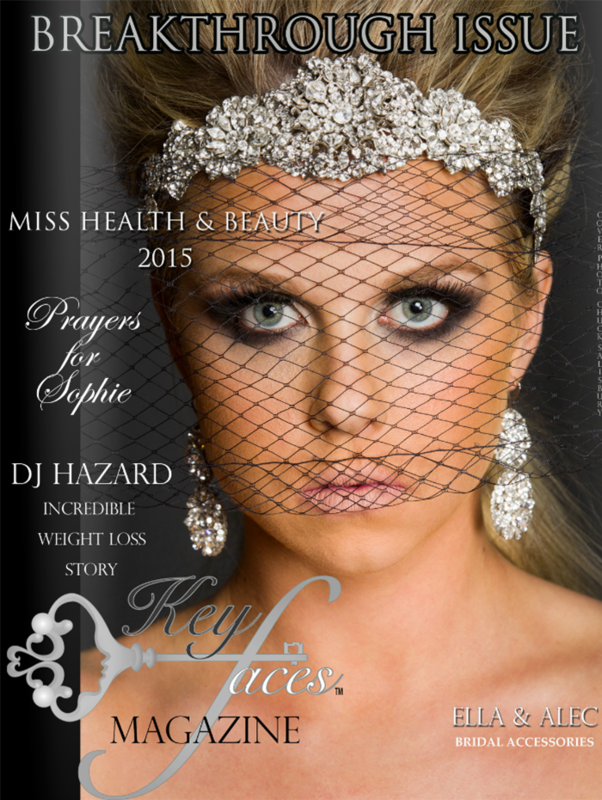 Clients have also flown Pacillio as far as Italy to have their hair styled by her. 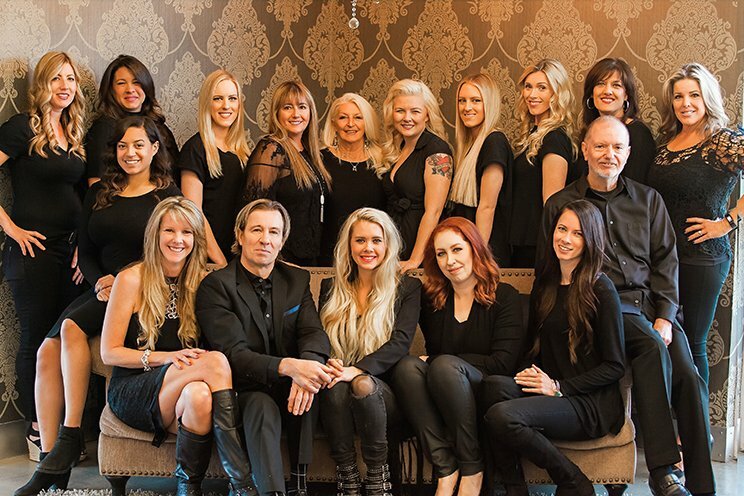 The Right Hair Salon has previously been recognized in the local community as being named Best Wedding Hair in 2014 by the OC Hot List and in 2009 voted the Best Hair Salon in Orange County by the Orange County Register. “We love the communities of Ladera Ranch and Mission Viejo and hope to provide great hair care and beauty services to them for many more years to come,” said Pacillio. For more information on The Right Hair Salon, go to therighthairsalon.com or call (949) 365-1012. Founded in 2007 by Master Hair Stylist Brandee Pacillio, The Right Hair Salon specializes in precision haircuts, styles, hair extensions, colors and highlights and styling for special events such as weddings and proms. 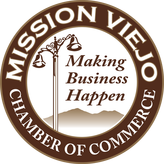 Located in Ladera Ranch and Mission Viejo the salon has been recognized in March 2019 as a Business and Community Partner by the City of Mission Viejo. 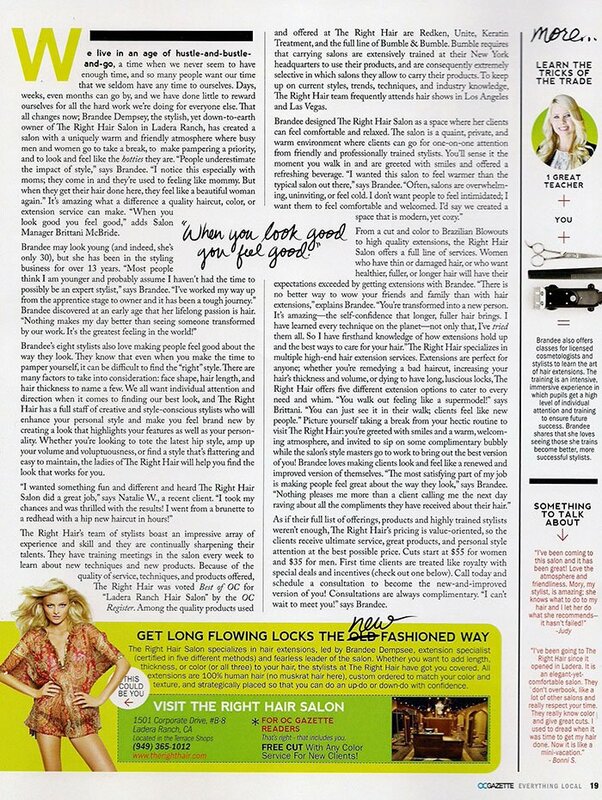 Additionally, the salon has won awards including Best Wedding Hair in 2014 by the OC Hot List and in 2009 was voted the best Hair Salon in Orange County by the Orange County Register, for more information on The Right Hair Salon, please visit therighthairsalon.com or call (949) 365-1012.